The Damon® System is a new clinically proven treatment approach that aligns your teeth and enhances your facial aesthetics usually without extractions or rapid palatal expanders. It uses passive self-ligating braces that eliminate the need for elastic or metal “ties” and the high technology wires that move teeth faster require fewer adjustments. 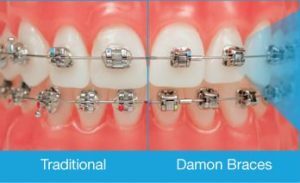 With the Damon System, treatment time is typically shorter than with conventional braces. And shorter treatment time means fewer appointments and a beautiful smile..faster. You may be surprised at how fast. Learn more about Damon System. My daughter has new braces and had an issue with them early that morning. I called to get an emergency appointment and had one immediately that morning first thing. The dental assistant took my daughter right and fixed the issue within 20 minutes. Love this office!